Free emagic Sound Diver GUI software for POD and Flextone II - gives you deep editing control from your computer. Win/Mac. Spider review at intermusic.com - excerpts: "The amp models are far less complicated than those on both POD and Flextone and here you can choose from six that cover most bases from which to construct any tone. Instead of a whole selection of inflexible effects modules, Spider offers a brand new feature; that of Smart Control FX. The effects are split up into Modulation and Delay, the former comprising a digital chorus, flanger and tremolo, alongside a stereo delay, ping-pong and tape echo simulation. You can only choose one effect from each module, but each is totally programmable. With the Modulation effects, you can increase the rate of each by turning the knob within that effect's control area." 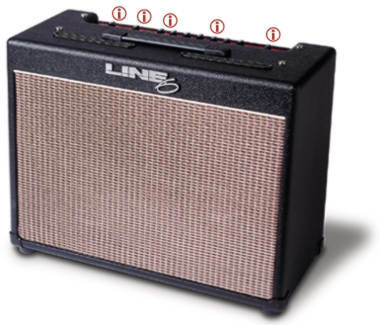 In Line6 products, are the Tone controls ever placed before the amp distortion? Yes - the treble control is pre-dist on some Line6 models, giving you a 1-band EQ pre-dist and a 3-band EQ post-dist. The more extensive "pre" placement in the Valvetronix is part of what is good or at least realistic sounding in the VOX Valvetronix design. A classic Boogie amp has more like a 4-band pre-dist EQ, and 5-band post-dist EQ. Flextone . $800 60 watt 1x12 TubeTone classic tube modelling. 16 digital fx. Hdphone, direct out, cab-sim output. Guitar Player July 1998. options as above, but no software. Flextone Duo - $950 2x10 combo, as above. Flextone HD - 300 watt stereo head. $1000. 4, 8 16 ohm out. Switchable series/parallel fx loop. Direct Recording out. MIDI remote out. 2x12 Flextone cab $500. Flextone Plus $899. 100 watt. 1x12 combo. stereo. 16 amp models, dig fx, hd and dir out, cab sim out. 1x12 extension cab $299. Line 6 has a strong online awareness, with many email addresses set up, including ideas at line6.com, info at line6.com. Software preamp uses patented TubeTone Amp Modeling technology to bring you a wide variety of sounds and effects modeled after some of the most popular sounds of classic tube amplifiers and stomp boxes alike. 4 programmable channels, an effects loop, headphone output, built-in cabinet simulator for recording without a microphone or direct box. Amp model selector - Thanks to TubeTone, includes a truly incredible collection of guitar tones, modeled from a collection of specific, sought-after amplifiers. The TubeTone Amp models were developed from in-depth studies of nearly a dozen different amplifiers: a 1952 Fender Deluxe; 1959 Fender Bassman; 1964 Blackface Fender Deluxe; 1964 Vox AC15; 1964/65 Marshall JTM45; 1968 Marshall "Plexi"; 1986 Marshall JCM800; 1994 Mesa Boogie Dual Rectifier; 1989 Soldano SLO; 1987 Roland JC120; and 1996 Matchless Chieftain. Plus the classic 1960s Arbiter Fuzz Face fuzz box. Turn the EFFECTS knob to choose the effect(s) you want, then turn the EFFECT TWEAK knob to make the effect more or less extreme, then tap the TAP TEMPO button to set the speed of your effect (for things like chorus and tremolo), or the tempo of your delay's echoes. Developed to meet the demands of the Line 6 Artist Advisory Board, the Flextone XL brings unprecedented tonal flexibility to the classic stereo 2x12 combo. The Line 6 Flextone is one of many solid state guitar amplifiers incorporating digital modeling technology to approximate the sounds of classic tube guitar amplifiers. Other contenders in this field include the Yamaha DG100-212, the Johnson Millennium, and Line 6's own AX2. Rather than spend pages comparing these other amplifiers to the Flextone, this review judges the Flextone on its own unique merits. The Flextone is available in several configurations. From least to most expensive, these are the Flextone (60W, 1X12, $799 list), Flextone Plus (100W, 1X12, $899 list), Flextone Duo (100W, 2X10, $949 list), and Flextone HD (300W head-only, $999 list). This review will focus on the Flextone Duo. The Flextone Duo is a stereo combo, feeding 50 watts per side into 10 inch Eminence speakers. 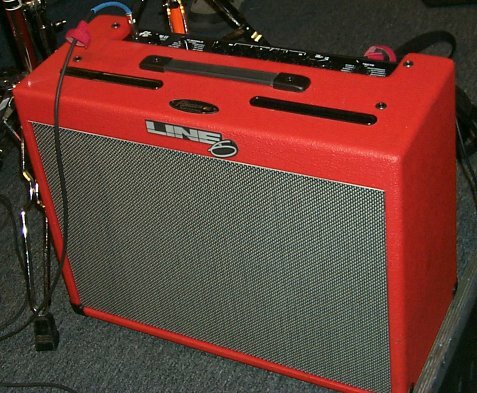 Line 6 uses Eminence speakers (rather than more traditional "guitar voiced" speakers like Celestions) because they have a relatively flat frequency response. This means the digital modeling alone has the most effect on tone, with no distortion from the speakers or the power amp section, which also means you get the same tone at practice volumes as you do at stage levels. The digital models present here are a cross-section of some of the greatest amplifiers produced in the last 45 years , including the Fender Deluxe, Fender Bassman, Vox AC15, Matchless Chieftain, Marshall JTM-45, Marshall Plexi, Marshall JCM-800, Soldano, and the Mesa Boogie Dual Rectifier Tremoverb. The fact that this amp uses digital modeling to produce its tones also means that the engineers were able to come up with some interesting hybrids- one grafts the top of a JC-120 onto the bottom of a Marshall JTM-45, one samples a Dumble combo and adds some digital tweaks, one combines the tones of several different lead amps and places the EQ post-gain, and the final is a layered model that superimposes a traditional "clean" amp and a modern high-gain amplifier, where the user tweaks the pre-gain to determine which proportions of the two models are used. Finally, there's a model of a 1960's Arbiter Fuzz Face. Great amplifier tones aren't the only thing present on the Flextone Duo, however- Line 6 has included a plethora of very transparent, very usable stereo effects. There's a built-in, user-defeatable noise gate, reverb, compressor, tremelo, two different choruses, two different flangers, rotary speaker, and delay. Although the noise gate isn't "tweakable", it's either "on" or "off", it's quite effective at reducing hiss and noise at loud (and even not-so-loud) volumes. Line 6's approach to reverb is unique as well; in those models of amplifiers where the original amp had a spring reverb (like the Fender Bassman), you get a model of a spring reverb- in models of amps without reverb (like the Marshall Plexi), you get a digital room reverb. The compressor is adjustable from 1.4:1 all the way to infinity:1. The tremolo is modeled after the classic Fender tremelo. The first chorus is square-wave modulated, like a typical "rack" chorus. The second chorus is sine-wave modulated, and modeled after the classic Roland CE-1. The first flanger is subtle, with no pre-delay. The second flanger is inverted, with a deeper range. The rotary speaker has two fixed speeds, slow and fast- a nice touch from the engineers at Line 6 is that when going from the slow to the fast speed (or conversely, from fast to slow) the speed gradually increases or decreases just like a real Leslie would. There are actually two independent delays built into the Flextone; each with a full three seconds of delay. Why two independent delays? When switching from one amp channel to another (for example, pre-verse or post-solo), the delay tails smoothly across the change rather than just abrubtly dropping off. The chorus, flanger, and rotary speaker on the Flextone Duo are stereo, and can be used individually, or in combination with the digital delay. (The compressor can also be used in combination with the digital delay.) Line 6 also includes a delay/swell combination which can be used to simulate an E-bow. The Flextone Duo, as shipped, has four programmable channels. These can be used to store any combination of amplifier model setting, EQ, gain, channel volume, effect type, and effect parameters. In addition, the top panel of the amp is also usable as a channel in "manual" mode. Adding the optional Floor Board footpedal controller ($299 list) gives the user access to an additional 8 programmable channels, and 16 preset channels. The Floor Board actually does quite a bit more than add access to memory locations, and subsequent paragraphs discuss this in more detail. The Flextone Duo's top panel is very user-friendly, and will have the most novice user tweaking and saving channel settings in no time. From left to right, there are 10 knobs; master volume, amp model select, drive, bass, mid, treble, channel volume, reverb level, effect tweak, and effect select. In addition, there are 7 buttons; manual, channel A, channel B, channel C, channel D, save, and tap tempo. There are only a few steps required to set up a channel to your liking and save it. First, choose the amp model from the 16 available, then set drive, EQ, reverb, and effects to taste. The effects are tweaked by a combination of the "effect tweak" knob and the "tap tempo" button. Typically (and logically), the effect tweak knob controls the intensity of the effect (or in the case of the delay, the feedback level of the delay); the tap tempo button determines the rate for the chorus, delay, flanger, rotary speaker, and attack rate of the swell+delay. Then, simply hit the "save" button once, choose the channel to which you wish to save your settings, and hit that channel's button. That's it! It's worth mentioning that any channel's settings can be tweaked while the channel's in use, like slowing down or speeding up the rate of a delay or the speed of a rotary speaker, or turning channel volume up or down, to adjust for live performance. The back panel of the Flextone Duo is also deceptively simple. There's the receptacle for the power cord, which is detachable and an industry-standard PC power cord, available nearly anywhere and in a number of lengths. (This is very smart design on the part of Line 6!) There's (of course) a power switch, a stereo headphone out, a remote in (for the optional Floor Board), stereo effects return, and stereo effects send. (NOTE: Stereo Line 6 amplifiers, the Flextone Duo, Flextone Plus, and Flextone HD, have a stereo effects send and return. The monaural 60W 1X12 Flextone has a monaural effects send and return.) The effects loop is pre-Master Volume. The send can be used as a Line Out in situations where you want to use the amp as an onstage monitor and feed the house PA direct, but take note that the Flextone's internal cabinet simulator is bypassed with this practice, and therefore it's recommended that you use a direct box between the send and the house PA. The Floor Board, although optional, is highly recommended. Not only does the Floor Board allow the user access to 8 more channels of storage, but it brings with it a plethora of other features. These include a volume pedal, a wah pedal (modeled after a classic '60's Vox wah), a chromatic tuner, and the ability to switch individual effects on and off in real time. The user gains the ability to footswtich distortion (which basically turns up the amount of drive, even if the drive is programmed at full), drive (which boosts/cuts channel volume), EQ (which boosts presence from 3-6 dB, depending on the amplifier model in use), trem/chorus (which switches chorus, flanger, tremelo, or rotary speaker effects on/off), delay (which switches delay on/off), and reverb (which switches reverb on/off). The Floor Board also has a tap tempo switch, and LED display. It connects to the remote jack on the back panel of the Flextone via a standard RJ45 (category 5) patch cable; a 20' cable is supplied with the Floor Board, and longer cables are available from any computer store. For those that simply want a remote way to switch among the four user channels on the Flextone, Line 6 also offers the FB-4 ($100 list). 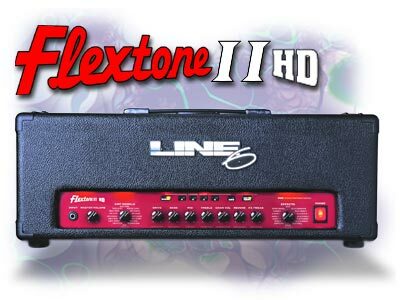 With all of the features discussed, the most important aspect of the Line 6 Flextone has yet to be discussed- how does it sound? I'm pleased to report that the sound quality of this amplifier is simply fantastic. Accuracy of the various models is highly subjective- it's fair to say that none of the amp models present in the Flextone sound exactly like the amps they're supposed to emulate. However, they're very close, and it takes either a highly trained ear or a/b-ing the original amp with the Flextone to discern the differences. Line 6's "Tubetone" modeling is simply the best (solid state) approximation of actual tube response and tone available today. It's important to note that the amplifier models are most effective when used in the manner or application where the original amps were used- in other words, a Stratocaster through one of the Fender models, a Les Paul through one of the Marshall models, et cetera. When used in this manner, the Flextone really shows off the amount of engineering and thoughtful design Line 6 put into this amplifier. For instance, the Fender Tweed Deluxe model functions very similarly to the original; the Deluxe had a single tone control (basically treble roll-off). In keeping with the spirit of the original, Line 6's "Small Tweed" model has the treble control pre-gain, and the bass and mid controls post-gain, so the bass and mid act as they would at a recording console. The Brit Class A (Line 6's model of the Vox AC15) is set up similarly. All of the models available on the Flextone are similarly produced; the tone knobs are faithful to their resultant tweaking on the original amps, the drive controls are faithful to the pregain, and as mentioned, even the reverbs are accurate in their approximation of the original amps. It's important to note that no amplifier can or will be one hundred percent accurate in reproducing the tones of twenty classic tube amps. The key thing for most players is variety, and the Flextone supplies that in droves, at a price considerably more reasonable than the Yamaha or Johnson offerings. Because the Line 6 is a completely software-driven amplifier, it's upgradeable, and installing an upgrade is a matter of turning four screws, removing a chip, and replacing it. As the Line 6 has no tubes, there's no warm up time, no fluctuation in tone based on room temperature, and no long-term degradation of original tone. Because the Line 6 uses flat-response speakers rather than voiced guitar speakers, the same tone is present any virtually any volume. Finally, because the Line 6 includes the most popular effects in the console of the amplifier, this enables a working guitarist to carry a few simple pieces of gear to a gig rather than fifteen or twenty. For the working guitarist, playing clubs, looking for tonal variety and the ability to reproduce some of the most popular guitar tones of the last 45 years, there's no amplifier offering more "bang for the buck" than the Line 6 Flextone.